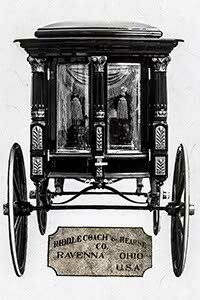 In March, April, and May of 1908, one year before the first motorized hearse was sold in Ohio, the Riddle Coach and Hearse Company filed away carbon copies of the daily correspondence in a thick binder that for one reason or another has survived to this day. In 2013 I was able to examine the binder and learn more about the day-to-day operations of the hearse and coach company. Judging from the style of the letters, most of these letters were written by the same person. I believe that was person was my grandfather Henry Riddle II. Whoever it was, clearly the writer had a sense of how to find and retain a customer and was the master of flowery and convincingly honest language. This is the carbon of the first letter that appears below. Click any thumbnail to enlarge it. 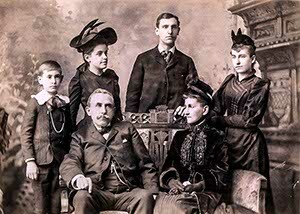 Henry Riddle I and family about 1890. 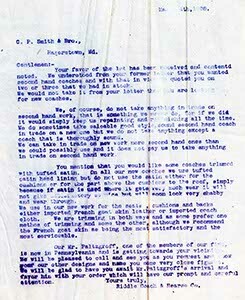 Presented here are selected letters from March 1908. Many of the letters below are to three salesman who traveled around the country. Unfortunately we only know any details about one of them, Frederick M. Paltzcroff. Fred married my great-gradfather's daughter, Bessie. Fred died in 1933; Bessie lived on until 1955. The other two salesmen were J. W. Atcherson and G. W. Thompson. • We are the greatest and selling for the best price! • Congratulatons, you have ordered a vehicle! • We shipped it, and when it arrives here is how how to unload it. • Pay up now we have men to pay every Saturday night.! • Letter to a salesman in the field, make him pay up! • Jobs in Ravenna for "girls." • A letter to his brother, Maxwell. 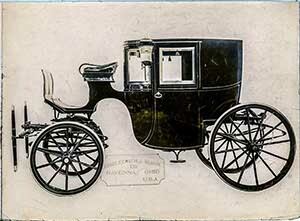 • The carriage business, thanks to the automobile, is finishe! • A hearse is lost in shipment. Your favor of the 1st has been received and contents noted. When understoodfrom your former letter that you wanted secondhand coaches and with that in view we quoted you on two or three that we had in stock. We would not take it from your letter that you are looking for new coaches. We, of course, do not take anything in trade on secondhand work, that is something we never do, for if we did it would simply keep us repairing and refurnishing all the time. We do sometimes take salable good style sound second hand coach in trade on a new one, but we do not take anything except a coach that is thoroughly sound. We can take in trade on new work more secondhand ones then we could possibly use and it does not pay us to take anything in trade on secondhand work. You mentioned that you would like some coaches trimmed with turfed satin. On all our new coaches we use tufted satin headlining, but do not use this satin either for the cushions or for the part above the cushions to the roof, simply because if satin is used where it gets very much wear it will not give satisfactory service but will soon look very shabby and wear through. We use in our new work for the seats, cushions and backs either imported French goatskin leather or imported coach cloth. We are trimming in both ways and as some prefer one method of trimming and some the other, although we recommend the French goatskin as being the most satisfactory and the most serviceable. Our Mr. Paltzgroff, one of the members of our firm is now in Pennsylvania and is getting towards your vicinity. He will be pleased to call and see you as you request and show you our other designs and name you some very close figures. We will be glad to have you await Mr. Paltzgroff’s arrival and favor him with your order which will have our prompt and careful attention. 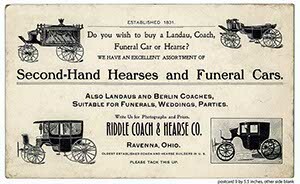 Riddle Coach & Hearse Co.
Yours of the 29th received, also tip off tail of the hearse lamp came by mail this morning. We will have to have another one sent to be like this one and will forward to you as soon as we can get it. Newark Coach Lamp Mfg. Co. Your telegram is received late yesterday afternoon telling us that the cross spring on hearse was broken on arrival. To the best of our knowledge this spring was all right when it left here and ought to have arrived in good shape. We can only think that some severe jolt on the railroad must have broken it. This spring which we are sending you is worth $2.50. You can put the bill in to the railroad company for the amount and remit same to us whenever the railroad company pays you. You may have to do a little fitting to use this cross spring, which we’re sending, as sometimes a cross spring is put on it is either lengthened a little or shortened a little like curling up the ends as the particular vehicle may require. Any ordinary blacksmith can do this if it is necessary, it may not be necessary to do it and you may be able to fit it right on without changing the spring any. The nut which you wanted duplicated came to us this morning from Sears and Scoville and we are sending you to-day by express the same one that we received from them and also a duplicate of it. We think you’ll find the new one we are sending to be the correct kind of a nut. We are very glad to be able to accommodate you and furnish you the nut that you seem to have difficulty in getting. While we do not know for sure that the funeral car was of our make, yet this would indicate that it was. We find you are still past due on your notes. You now have two notes due $100 and interest each due Nov. 25, 1907, and Feby. 25th, 1908. You promised us that you would pay the one due Nov. 25th on Feby. 17th, which is more than two weeks ago. You will accommodate us by going to the bank and taking care of at least one of these notes and both of them if possible. with bill of loading for the shipment. Shipment has gone forward via the Penn R. R. in our private freight car #12 and we enclose herewith key for lock on said freight car. Inside the freight car you will find planks on which you can run the funeral car out and down to the ground. Have plenty of help and use great care in unloading not to let it strike any place as you bring it out the freight car doors. Watch especially the top as there is not any room to spare as the funeral car turns to go down the planks. In fact it would be a good plan to get a couple of more planks and thus make the runway longer and not quite so steep so arrange as to bring the funeral car out of the freight car nearly on the level. We could also suggest that you put some good stout boxes underneath the planks to help support them while unloading and thus avoid any possibility of an accident. Inside the funeral car you will find the pole straps, wrench etc..
After unloading, please put the planks, cross pieces, back into the freight car so they will be sure to come back in it. Close the freight car doors, lock the padlock into a convenient staple, mail the key back to us and notify the freight agent you have unloaded, requesting him to see that our private car is immediately returned home, as we have a great deal of shipping to do and need all our freight cars very much indeed. We have your letter of the 2nd in reference to excellent second hand hearse #1567 and same has our attention. It is possible that the prospective customer that you have might be able to buy an old second hand hearse of some liveryman at a less price that we could furnish #1567, but the chances are that he would get very much less of a hearse. This hearse #1567 is all done over in nice shape, the paint is in good shape, has been recently touched up and varnished, the silver mountings are in good shape and it is in nice condition every way, while any hearse that he would buy of the livery man would probably be just as it was used and would need the painting and other repairs in the silver mountings, if there were any on it, would probably need replating and so on. Of course we might be able to sell a secondhand hearse just as we got in and just as it was used for less money than if we had put it in good condition and then considerable work on it as we have on #1567. We understand, of course, that price is a strong talking point with the man who has something to buy and is also a strong talking point with those who have something to sell, but when the seller makes a low price and gives the value, although in figures the price may be higher, figuring from the value standpoint, the price might be very much lower. The condition of the hearse, its value, its price and lasting qualities makes its value in such items as the value, grade or what ever you want to call it, is something to be considered when the price of something else more attractive. In #1567 we are offering big value for the money and we believe better value to the customer than buying the hearse that needs repairs and refinishing. He had better pay a little more for hearse and have these things all done than to buy one at too cheap price and either have a poor looking affair because it needed repairs or to be laid out of the use of it while doing repairs. Your letter of the 2nd has been received and contents noted. We certainly regret very much indeed to hear of your runaway accident. As soon as the door arrives we will give it our prompt and immediate attention and return it to you with the least possible delay. It would be impossible to furnish use some other door that would fit, because each door is hung and fitted to its individual vehicle and in no door, although made for the same style of a coach, would fit right, therefore the only way will be to repair the broken one. You ask us to let you know what the cost will be. We cannot let you know what the cost will be in until the repairs are done. Of course will make it as low as we possibly can. Your letter of March 2nd has been received and contents noted. While we would be very glad to have a call from you here at our factory to make a personal inspection and selection from our various designs of funeral cars, and while such a visit might be interesting to you to see how we build our funeral cars, the high quality of material used and the care used in their construction, yet as you intimate in your letter, the funeral cars would be just the same and you of course can trust us as old established vehicle builders to furnish you a vehicle that has care in all details of construction. And we believe you can trust us as a reliable and responsible concern of many years of business standing to furnish you exactly what we agree. As no doubt you may be aware we are the oldest established concern in the United States building funeral vehicles. We are coach builders and for a period of more than fifty years have given our entire attention to this work, which is the highest class of vehicle building. 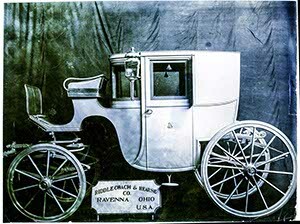 We are not coffin makers, nor have any such department connected with our business, nor are we builders of cheap buggies, or in fact any kind of buggies but have always built and adhered to the higher class of vehicle building, coaches and hearses. We are perfectly aware that some cheap hearses are made; some of them are made by buggy builders and some by manufacturers who build some hearses as sort of a side issue. We are strictly vehicle builders, that is our business and it is not a side issue to some other business but is the main and principle business. We believe you as a business man, and, as interested in manufacturing, will realize that experience such as we have had and strict adherence to high class work amounts to something, and while the original price night be little more as to figures, yet taking into consideration the value offered and comparing the value of the vehicle with something made inferior even if it were a little less price it would actually be higher and less value for each dollar. We are aware that with some concerns that price is a strong talking point with the man who has the vehicle to sell; we are aware that the price is a large consideration in the mind of any purchaser but it is a mistake with any of us no matter what we are buying to overlook intrinsic value, quality and grade and is sometime lost sight of when the price of another article looks attractive. Now we may have a price somewhat higher than some one else, but we never lose sight of the high quality and while our price may be higher in figures yet in the matter of actual value for the money it might be very much lower. At any rate we know all our prices are absolutely consistent with the actual cost of the vehicle and we also know that any concern in our line of work cant produce the same article using the same high quality of material and workmanship that we do for any less money than we can. We are enabled to produce the very best work at the very lowest possible price; we are located in a small town and therefore all heavy city expenses are eliminated. You can produce the goods which you manufacturer we feel confident is saying at a less cost in Centreville than you could produce exactly the same article, using the same quality of material and some workmanship than you could produce it in New York, Philadelphia, Chicago or any other large city where from the small item of telephone rental to the large item of labor expense would be greater. We are just as anxious to do business as any concern on earth and we will make as low prices as we possibly can in all cases and therefore if any one makes you a less price than we do we feel justified in saying that it is a different article, costs less to produce, quality of material less, class of workmanship less, otherwise it could not be sold for less. In response to your request for photographs of various designs which you mention, we are sending them by this same mail for your consideration. We are also sending you photograph #845 which is a little more elaborate design than the particular styles which you mention. This design,#845, is a $1200.00 car but to you we will name the special spot cash price F. 0. B. cars here of $950.00. If you would prefer carved panels in #845 instead of the small glass in the side we could furnish handsome hand carved rose design panels for $25.00 extra, making #845 with panels £975.00. No. 847 is our regular $1000.00 car, our lowest cash price is $960.00, but as we have got to figuring them down below a legitimate profit to you, we have concluded to name the special spot cash price of $825.00. In a like manner, on #861 which is our $1050.00 car we will make the price $850.00. On #856 we will make the price $865.00. This is a $1100.00 car. If you want hand carved drape design panels at the small side glass in #856 we would make the price on the car finished that way $900,00. We could furnish any of these designs promptly, furnish you with a first class car in every respect, one that you would be proud to use and one that would give you satisfaction. The freight to your city on any one of the above mentioned designs would be $24.00, and as a special consideration for prompt acceptance we would allow you one half the freight. This is something we never do; we make all our prices F.O.B. cars here, but as we are anxious to do some business with you we will pay half the freight. The above mentioned prices are very low, lower than we can afford and they are for prompt acceptance and we ask you to hold them strictly confidential between us. As we have already written you the fine silver funeral car went forward on the 3rd. The shipment went via. the B. & 0. R. R.. Shipment is made in a large door box car from which it is very easy to unload. You should have the freight car placed beside the station platform so that you can bring the funeral car out of the freight car to the station platform and then down to the ground. The funeral car is taken off its wheels and set down flat. You should get some good strong 2x4 pieces to put under the axles to slide it on out of the freight car to the station platform. After you have the 2x4 pieces underneath the axles you can slide it forward with four light crow bars. Have plenty of help and use great care not to let it strike any place as you bring it out the freight car door and you will have no difficulty whatever if you will have plenty of help and go at it carefully and slowly. After you have it out on the station platform you can set it up on its own wheels and run it down to the ground. Inside the funeral car you will find the pole straps, wrench etc.. The push button which operates the electric bell is on the bottom near the doors. We have drawn on you for the cash payment and sent the papers for your signature in accordance with contract as contract provides to the Bank of Fairmont. Please call there and attend to same. We have sent you a fine, handsome and elegant funeral car, thoroughly first class and up-to-date in every particular and one of which you can feel very proud. We wish to warn you again in reference to keeping the price absolutely confidential. We have sold this to you very much underprice, very much less than we had ever sold one before equally fine, or could afford to sell as a regular thing and we trust that you will keep the price absolutely confidential. Yours of the 3rd received written from Frostburg, Md., and as requested we enclose herewith P. 0. order $100.00 sent you in the usual way. Enclosed in your letter was order J. H. Markwood, Keyser, W. Va., for #858 silver grey car, also his check for $50.00 as part payment. Considering the extra panels, trimmings for the seat of his #884 black car you certainly cut the price down below rock bottom. However after due consideration we have concluded to accept the order. We note what you write about carving around the molding at the top. The crown molding on #858 car is not intended for carving, is not made in just the right shape for carving and then it is very difficult to do any carving on a car after it is all built. In order to put carving on of that kind it should be done at the time the car is built. We will write him as you suggest but if you promised him carving around there we are certainly up against it. We will also put the carving on the bottom of the doors, but that is an item that always causes delay and some extra expense. We are surprised that Markwood or any one would speak about that point, for the photograph does not show whether there is any carving there or not and usually it does not enter their mind. We are also in receipt of yours of the 2nd from Keyser, W. Va,, and hope that you can sell Heffner of Frostburg, Md. a light black car. Also note what you write about a new undertaking firm at Morgantown and hope that you can land them for a good order. Also enclosed in your letter was memorandum order for harness for Guy M. Hayes, Morgantown. As you say there is nothing very much in harness for us unless it is included in an order for a coach or funeral car so that the security, payments etc. will cover the harness as well the funeral car. We never sold a harness on any such terms as Hayes wants, for all articles of that kind are always strictly cash. Another thing your order says #166 harness with long hame tugs; #166 harness has not long hame tugs but has short hame tugs. No. 166 harness is not made with long hame tugs and we cannot buy a harness with long hame tugs, breeching and collars for less than $72.50 cash so it would leave a profit to us, providing we get all the money of $12.50. Do not take an order for a long hame tug harness for less than $90.00 and when they want time we ought to have $100.00, for it may mean running after the money. We will however fill this order for Hayes as soon as we get the harness. We haven’t a long hane harness in stock and will have to order it. Will send it to him as soon as we can get it here. Your letter of the 3rd has been received and contents noted. We are pleased to hear from you and would like very much indeed to sell you a hearse. No. 1567 excellent light weight black hearse, has six urns as photograph shows, large plate glass in sides, glass in doors, silver inside rails, silver mounted lamps, black draperies trimmed with black fringes and tassels, painting all black with fine line striping. This hearse is in excellent condition, paint is in good order, it has been newly touched up and varnished. This hearse is really worth $300.00 to wear out but to you we will name the special cash price of $160.00. No. 1594 black hearse, has large plate glass in sides, swell glass in front and doors, carved ornaments on top, silver mounted lamps, silver inside rails and other silver mountings. Painting black in good condition and it has been newly touched up and varnished. This photograph was taken just as we got the hearse in, since then it has been touched up and revarnished so that it looks very nice indeed. This hearse is in good running order and will last in use for many years. This hearse cost new $900.00 and is really worth $500.00 to wear out in use but to you we will name the special cash price of $225.00. A whippletree or whiffletree is a mechanism to distribute force evenly through linkages. The mechanism may also be referred to as an equalizer, leader bar or double tree. It consists of a bar pivoted at or near the centre, with force applied from one direction to the pivot, and from the other direction to the tips. Several whippletrees may be used in series to distribute the force further, such as to simulate pressure over an area as when applying loading to test plane wings. Whippletrees may be used either in compression or tension. – Wikipedia. No. 1566 elegant black hearse, has six hand carved urns, black draperies trimmed with black fringes, has large French plate glass in sides, swell glass in front and doors, silver mounted lamps, silver inside rails and other silver mountings such as wiffletree tips, hub caps, door handle etc. . This hearse is painted black is in fine condition, has been newly touched up and varnished and looks very nice indeed. This hearse is really worth $400.00 to wear out is use but to you we will name the special cash price of $275.00. No. 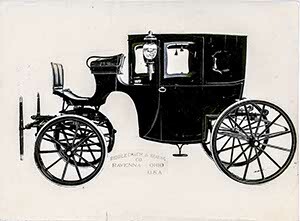 1576 excellent four column design black funeral car, has mosque top, large French plate glass in sides, glass in front, glass in doors, heavy black broadcloth draperies trimmed with heavy black fringes and tassels, silver mounted lamps, whiffletree tips, door handle etc , as photograph shows. This funeral car is in excellent running order throughout painting is all black, paint is in good condition, it has been newly touched up and revarnished and looks very nice indeed. This funeral car is really worth to wear out in use $500.00 or $600.00 but to you we will name the special cash price of $325.00. At the present time we have all of these hearses in stock and ready for immediate shipment but as it is second hand and we are selling and shiping continually we can, of course, quote them only subject to prior sale. The above mentioned prices are extrenely low and strictly net and spot cash, but if it were not convenient to pay all cash if you would pay $100.00 or more cash you could pay the balance $50.00 every three months. Notes bearing 6% interest and secured in the usual manner on the hearse to be given for the deferent payments. All these hearses are regulation adult size and just what the practical undertaker needs to go out and do business with. They are in good runnign order throughout and are bargains and big value for the money at the prices quoted, and will not remain unsold very long. We trust we may hear from you favorably with order for one of these excellent hearses and assure you our prompt and most careful attention. Your favor of the 4th has been received advising us of the arrival of the Palace Pall-bearers Coach. We are very glad to hear that the shipment went through all right, and certainly regret very much indeed to hear of the mar which you mention on the back of the body. We supposed that we sent you one of the finest coaches of this style that was ever turned out and we believe you will find it to be such. We certainly hope that the mar which you mention is not very serious and can hardly think that it could be, otherwise we would have noticed it before it left here. Possibly it might have occurred on the way, for it is not always possible to get every vehicle to its destination without some slight mar, which can be easily touched up. You say however in your letter, that the mar had already been touched up, therefore it must have occurred before shipping. We endeavor to be as careful as possible about everything but you as business men employing others to work for you, can realize that it is difficult for any one to be able to watch at all times all the employees. The mar must have occurred and some employee discovering it touched if up; we assure you it is entirely without our knowledge. If it can be improved any by further touching up and you desire to do so, please have it done and we will be glad to make up any expense you are in reference to it. We think you will find this coach to be one of the best and most satisfactory vehicles you ever invested in and be a splendid money earner for you. We find all owners get from 25% to 50% more for their use at a funeral than for an ordinary coach, that is they get $6.00 or $7.00 while for the ordinary coach they get $4.00 or $5.00, thus the extra earning capacity makes the coach more profitable. They also get in proportion for other work outside of funeral work. We did not know you wanted a photograph of the coach or we would have been glad to sent it at the same time the shipment was made. We are however sending you one by this same mail. We also notice in Mr. Atcherson’s letter that you wanted a cut to use in a newspaper, and we are sending you a cut by this same mail. Our Mr. Thompson forwarded to us your order for one set of Coach Harness. The order happened to catch us with that particular design of harness and one that would fulfill your specifications not in stock ready to send out. We will therefore have to delay the shipment a little. We will however forward it just as soon possible, which will be without very much delay. 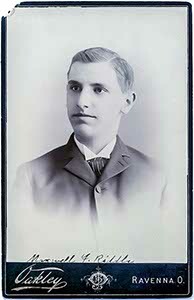 Mr. Thompson has made you an extremely low price on this harness, in fact it scarcely lets us out on the cost, but in consideration of past favors and that we may be favored by your future orders we will send the harness at the price Mr. Thompson made you, although as stated above it is less than we can afford. Your letter of the 4th from Elwood has been received and contents noted. We of course would not in any way consider any such proposition as Kightlinger J Manring made you. We will write them right to that effect. We think they had a lot of cheek to get you to go to the expense of going to Elwood about something they could have written us and found out just as well. We think they are very foxy and are studying and figuring all the time how they can get out best and don’t care whether the other fellow gets out right or not. They still owe $2325,00 and a years interest on that amount. We will write them that you have written us of their talk; that we could not consider the matter at all. That we furnished them the vehicles in good faith, gave them time to pay for them on their representation of being worth considerable property, that of course we will expect them to make the payments as they fall due. That if they desire to go out of the business the only thing for them to do is to pay us and then they could sell the vehicles the same as any other property. We think it would be just as well for you to miss going to Greentown for the present. We just had a letter from our Mr. Atcherson telling us of his call on you, and we certainly are very much surprised to learn the reason that you asked to have Mr Atcherson come to see you. Mr. Atcherson informs us that you requested him to write and ask us if we would take back some of the vehicles which we furnished you, giving you credit etc. for them. This is something we never do. We furnished you the vehicles in good faith and will of course expect you to pay for them as the payments fall due. If however you desire to discontinue business at Elwood or Grandtown or both places, you can arrange to pay us the balance due and then you can sell or dispose of the vehicles the same as any other property. It would be entirely out of the question for us to consider taking the vehicles as you suggested to Mr. Atcherson. Your letter of March 3 has just this moment been received and contents carefully noted. We note that our design #847 is about what you want and we would be very much pleased to furnish #847 to you finished black, and also the same design finished white. It would make you a splendid outfit and we know you would be very much pleased with them. We would be glad to furnish you one of this design finished white, but, as we stated in our former letter, we think if you give the matter consideration you will find it to your advantage to have one finished silver gray instead of white. The silver gray finish is a little later than the white finish and we find all our customers who are anxious to have the very latest style are now buying the silver gray instead of the white. You understand, of course that it does not make the least bit difference whether we would furnish you with the white car or a silver gray car as we can furnish either way, and we only make the suggestion for your consideration, as we believe it would be to your benefit to get the silver gray car in place of white one, whether you buy of us or of someone else. We note what you write in reference to price. The price quoted on #847, $800.00 is not the price of this car but on the other hand is very much below our regular price and the special price was made you taking into consideration the very items that you mention that exist at the present time. We all realize that times are a little panicky and have been for the past few months and while we believe they are brightening considerable, still at the same time it may be some little time for business to resume the excellent conditions that had existed for several years past. In quoting you the price which we did, we took into consideration this very fact and made them as we stated in our former letter, way down below regular prices, and also made the prices especially low for an order direct to us and not through any salesman or commission house to whom we would have to be paid a commission and in quoting you the prices we eliminated what must be usually added for selling expense. We are strictly vehicle builders and develop our entire attention to the building of funeral cars and coaches, which followed them and have done so for a period of more than fifty years. This is the highest class of vehicle building there is and we have developed a lifetime to this kind of work and given it our exclusive attention. We believe that we can furnish more value for the money than can some concerns who build hearses as sort of a side issue and whose principal line may be either in the manufacture of coffins and caskets or cheap buggies. You might receive a quotation for funeral car at a less price then we name but that the individual article might also be very much less value. We know that the price is a strong talking point with the person who has something to sell, and we also know that price is a strong consideration with every buyer. However the value of an article taking into consideration the price quoted for it, the actual value offered, the price may not be as high as for some other article, at less price. It sometimes happens that intrinsic value, quality and grade is too frequently lost sight of when the price is attractive. Now we may have a price a little higher than some competitor but we never lose sight of the quality, and while our prices may seem higher, yet it is absolutely in accordance with the actual cost of the vehicle. And no concern on earth can produce any funeral car at a less cost than we can providing they use the same quality of material in the same high-class workmanship. For great many reasons we are enabled to produce work at lower than some others in a similar line because we are located in a small town where the heavy city expenses are eliminated and where what are usually termed, overhead charges are very much less. While the price named to you was strictly net and spot cash, yet if it is not convenient to pay all cash we can always give you terms of payment to reliable and reasonable parties. We do not know just what kind of terms would suit you best but we presume you would want to pay $300 or $400 cash and then the balance could be extended over a period of one, two, or three years in monthly or three monthly payments. Notes bearing 6% interest and secured in the usual manner on the vehicle to be given for the deferred payments. We certainly have showed our willingness to concede all possible in making you the special price as quoted in our former letter. We think however that you need not fear very much, because we have during our business career gone through several panics and all the time doing business with the undertakers. The undertaking business is something that must be continued whether times are good or bad and our experience has been, that there is never any panic in the undertaking business. It is very true that sometimes collections may be a little slow for a time, but that always comes out all right in the end. If you would favor us with your order we would do our utmost to please you and believe we are offering you more value for the money than you could get elsewhere, although some other price might be lower. We are just in receipt of your two letters from Lonaconing, Md. one of them enclosing order for #856 silver grey car from Hafer of Frostburg, Md. and the other enclosing order from August Eichhorn, Lonaconing, Md. for #661 black car and same have our prompt and immediate attention. Enclosed also in the letter was check of Eichhorns $50.00 to apply on his purchase and check of Hafer $25.00 to apply on his. We have not gone into the minute details of the orders at this writing but unless we are mistaken we have the cars that we can get right off without any delay. You wrote us in one of your recent letters that you had sent expense books in a separate letter. They have never been received yet they must have got lost on the way unless you overlooked mailing then. Please send them in as your expense account is behind on our books and we like to keep such things right up to date. You will remember selling D. N. Walter, Elm Grove, W. Va. a black car and also a wagon. He is not any too good pay and at the present time is laid up sick and has one note past due. In accordance with instructions on the contract at the time you sent in the order, we sent the notes for collection as they fell due to the State Bank of Elm Grove. We did not notice in Bradstreet that the President of that bank was D. N. Thornburgh, who is one of the partners in the undertaking firm of Thornburgh Bros. of Elm Grove. Walter wrote us once or twice that the reason he did not pay his note on time because the bank did not notify him. We did not take much stock in what he said and thought that we was fibbing a little. We would not be surprised however since, we have found out that the head man of this bank is in the undertaking business, that they failed to notify Walters. Perhaps they are not very good friends, sometimes undertakers are not, you know. But to come to the point; recently Flickinger, the coffin salesman, who we think you know, was in Elm Grove and he was talking with Thornburgh Bros, and they intimated to him that if Walters was going to bust up they might buy the funeral car and wagon. We don’t think that it is necessary to take into consideration that Walters is going to bust up, for we don’t think he is from anything we have been able to learn. But when you get in around that section you had better go and see Thornburgh Bros., for from the way Flickinger talked we think maybe a car could be sold to them. According to Bradstreet they are rich and would probably pay cash. Also when you get around there you can see whether Walters has paid his note. Since we have found out about the Elm Grove State Bank being owned by this undertaking firm we have changed and sent Walters notes to the First Nat. Bank, Elm Grove, in fact the one that is now past due is theirs is at the bank. Of course the Elm Grove bank do not know this; they returned the note to us unpaid and we simply sent it to the First Nat. Bank. They of course do not know we hold any more of Walters notes or anything about it, as we’ve had no correspondence with them whatsoever. We are just in receipt of your letter of the 5th enclosing the John Knight order for #658 silver gray, same has our attention. It will be necessary to take #826 body to finish up to fill this order. We haven’t got a #856 body that is already not covered with an order, except two of them that are all finished black and in the repository. We don’t suppose Knight will know the difference and he is getting a better car. It is about the only thing we can do under the circumstances. We have a #858 that is coming through the shop silver gray but it is covered by an order that Thompson sent in a few days ago from J. H. Markwood, Feyser, W. Va. .
We have just telegraphed you “not to go to Lonaconing, Md. or to Frostburg, Md.” You remember we had an inquiry from August Eichborn, Nonaconing, Md., and we wrote him that he would call to see him. Thompson got over to Keysor, W. Va. and heard either through some traveling man or some undertaker that Hafer, who has been interested in the Frostburg Und. Co. had withdrawn from that company and was in the market for a car, so he hiked right over to Frostburg to try and get his order. In which he succeeded and got an order for the #856 silver gray. He then heard from Hafer that Eichhorn wanted to buy a black car, so he jumps to Lonaconing and takes Eichorn’s order for the #851 black car. The Eichhorn order is $900.00 cash, and the Hafer order is $850.00. We knew you expected to go to Lonaconing so we thought we had better telegraphed you so that Mr. Eichorn “The Furniture King” would not get things complicated. Thompson thinks that after these two cars get there he can sell the Frostburg Furniture Co. a grey car, and then a little later on sell a grey car to Eichhorn. Whether he called on the Frostburg Furniture Co. or whether he made them any figures we do not know, as he does not say in his letter. Nothing further new. Mr. Paltzgroff has made you a very low figure on it, but we are pleased to do some more business with you and accept the contract at the low figure. In finishing up this funeral car specially for you no pains will be spared to have it fine and elegant in every way and one that we know you will be very much delighted with. Shipment will go forward promptly and we can promise you a very handsome and elegant car. 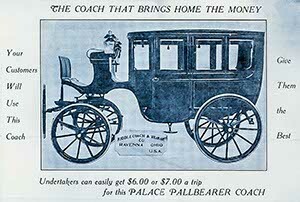 We would be very glad if you would let us send you the fine Palace Pall-bearers Coach at the same time with the funeral car. We know that you would find a Palace Pall-bearers coach a most satisfactory vehicle and one that could not fail to be a splendid investment for you. Kindly think the matter over and we will be pleased to have you order the Palace Pall-bearers Coach and ship them both at one time. We have your letter of March 4th and contents noted. We have had over 50 years experience building vehicles and we thought that we had a pretty good knowledge of their make, and also supposed that all these years of experience in nothing what ever but the vehicle line, that we knew something how axle boxes and so on worked. We also felt quite sure after 50 years experience building vehicles, selling them to experienced undertakers and livery man all over the United States, that we knew how to select both material of high-quality and knew and were able to recognize skilled workman. We gave you in our former letter what we believe from our little experience in the vehicle business to be the effect you stated in your first letter. We know of no other cause after a vehicle has been in use for three years to make a box stick on an axle and consequently grind out in the hub, except the fact that the axle has been allowed to run dry. We know of no other way that a box could be loosened in a hub to such an extent as you wrote, except setting on the spindle, for even if a box were only loosely fastened in the hub, it turns so easily on a spindle that when the spindle is in proper condition that it could not grind out on a hub, which would take a large amount of pressure. When a force is exerted against any article it moves in the way of the least resistance. A smooth well oiled spindle furnishes but very little resistance to a box turning, while the box is held firm in a Rock Elm hub, therefore how it could turn in that hub when it could turn so easily on the spindle, unless the spindle has become dry in the box consequently stuck. We use strictly first-class materials from start to finish and superior workmanship. If you can find better workman than we have, we would be glad to employ them and furnish you a big bonus for getting them for us. We also desire to say to you that the world does not produce better materials then we use. These materials and this kind of workmanship were used on your funeral car, the same as every piece of work that we turn out. We’re pleased to be able to inform you, that we have to-day shipped you to the fine coach per your order. That shipment has gone forward via the Erie R. R. Which line it takes to Marion and from there to your city on the C.S. & H. The shipment is made in our private freight car #16 and we enclose herewith key for lock on said freight car. Inside the freight car you will find planks on which you can run the coach out and down to the ground. Have plenty of help and use great care in unloading not to let it strike anyplace as you bring it out of the freight car door. The coach is taken off its wheels and set down on small wheels. You can run it out of the freight car on the small wheels and then set it up on its own wheels. Be very careful however, as you run it out that the bottom of the body or steps does not strike. You will have no difficulty whatsoever if you are there yourself and watch carefully. After unloading please put the planks, cross pieces which hold the coach in the place while on the way, also the small shipping wheels, back into the freight car so they will be sure to come back with it. Then close the freight car doors, lock the padlock to a convenient staple, mail the key back to us and notify the freight agent you have unloaded, requesting him to see that our private freight car is immediately returned home, for we have a great deal of shipping to do and need all our freight cars very much indeed. We have drawn on you for the cash payment and sent papers for your signature made out in accordance with agreement to the Commercial Nat. Bank your city, please call there and attend to same. The extra pair of pull straps were put into the coach and we enclose herewith invoice for same, for which you can remit. The extreme hot weather will soon be with us and care should always be used not to permit a new highly finished vehicle stand exposed continuously to the hot rays of the summer sun, for being black and having so much glass about it naturally attracts the heat and hot sun might blister the varnish. When compelled to wait anywhere it is a good plan to get in the shade, if convenient, if not keep on the move. We mentioned this simply as a warning. We have sent you a fine, handsome and elegant coach, thoroughly first-class and one of which you can feel proud. Your letter of the 7th has been received and contents noted. We have been delaying taking any severe action in reference to your long past due notes as we were in hopes each day and each week that we would receive some remittance for them. It is now six months since you have paid anything and we positively will not let the matter run any longer. We must insist that the above mentioned amount be paid or at least a considerable portion of it and if you will forward us the money, we will cancel the notes and send them to you and you can execute the new notes to your friend, whom you mention, or if he would prefer we can send the notes to the bank in your city duly endorsed over to him without recourse on us and he can pay the money into the bank and get the notes and the bank can remit to us. We will expect prompt attention to this matter. We have sent you to-day via, Penn. freight, bill of lading enclosed herewith, one Park City lamp, it has broken glass. Please put in new glass and return promptly. You will notice we do not send the tail for the lamp; we could get it into a smaller box without the tail and the tail is all right. We mention this so you will understand. Please give it prompt attention. 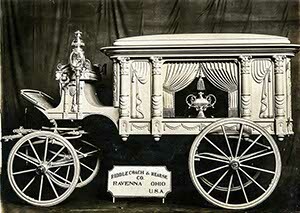 We are pleased to be able to inform you that we have to-day shipped you the fine silver grey funeral car per contract. The shipment going forward to Lonaconing, Md. in same freight car with the funeral car for Mr. Eichhorn. Shipment being made as a car load at car load freight rates. Shipment leaves here on the Penn. R. R. in our private freight car #18 and will arrive in Lonaconing on the Cumberland & Pennsylvania R. R..
We write you just a few lines to let you know the shipment has started. Full details and particulars will follow by later mail. We are pleased to say however, that we have sent you a fine, handsome and elegant funeral car, thoroughly first class and up-to-date in every particular and one of first which you can well feel proud. Your letter of the 8th has been received and contents noted stating, that you want something less in price in the way of a hearse than those quoted in our former letters. Your former letter was from Ludington, Mich., and therefore in selecting designs we selected those that we thought would be suitable for Ludinigton. 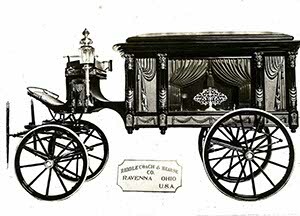 No# 1567 excellent light weight black hearse, has six urns as photograph allows, large plate glass in sides, glass in doors, silver inside rails, silver mounted lamps, black draperies trimmed with black fringes and tassels, painting all black with fine line striping. This hearse is in excellent condition, paint is in good order, it has been newly touched up and varnished. This hearse is really worth $300.00 to wear out but to you we will name the special cash price of $160.00. No. 1594 black hearse, has large plate glass in sides, swell glass in front and doors, carved ornaments on top, silver mounted lamps, silver inside rails and other silver mountings. Painting black in good condition and it has been newly touched up and varnished. This photograph was taken just as we got the hearse in, since then it has been touched up and revarnished so that it looks very nice indeed. This hearse is in good running order and will last in use for many years. This hearse cost new $900.00 and is really worth $500.00 to wear out in use but to you we will name the special cash price of $225.00. No. 1566 elegant black hearse, has six hand carved urns, black draperies trimmed with black fringes, has large French plate glass in sides, swell glass in front and doors, silver mounted lamps, silver inside rails and other silver mountings such as whiffle tree tips, hub caps, door handle etc. . This hearse is painted black, is in fine condition and has been, newly touched up and varnished and looks very nice indeed. This hearse is really worth $400.00 to wear out in use but to you we will name the special cash price of $250.00. All of the above mentioned hearses are excellent ones and are bargains at the prices quoted. The above mentioned prices are strictly net and spot cash, but if it were not convenient to pay all cash, to reliable and responsible parties we can always give easy terms. If you would pay $100.00 cash you could pay the balance $50.00 every three months. Notes bearing 6% interest and secured in the usual manner by contract on the hearse to be given for the deferred payments. The above mentioned hearses are all in good order, regulation adult size are nice vehicles. You mention in your letter something down as low as $125.00. The hearses that we would have at that price are not done over but are just as they came in without any repairs done on them and not what you would want, while the ones that we quote you herewith are all done over in good shape, paint in good condition, mountings in good condition, newly touched up and so on so that they look very nice. We do not have photographs until the hearse is done over and therefore, we could not show you any designs that we have that are not done over, as we would suppose you would not want them any way. We have #1587 and 1566 all ready to ship; we did happen to take a photograph of #1594 before it went into the painting department. It is now in the painting department being touched up, revarnlshed etc, but it will be ready in the course of ten days or such a matter. We would be glad to sell you #1567 which is very cheap at the low price quoted, $160.00, but we really think you ought to either buy #1566 or #1594, for they are very nice hearses and while it might take you a little longer to pay for them, yet in end we believe you would be better satisfied than to buy something too cheap. Of course you do not buy hearse for use for one month, or two months, or for a year or two years, but by it to use for several years, and therefore a little more in the purchase price will give you more satisfaction in the beginning and be a better purchase. Your letter of the 9th, has been received making proposition on excellent hearse #1576 and same has our attention. We quoted you such an extremely low price on this hearse that really we cannot afford to add even the expense of putting a brake on it the price quoted. However after due consideration, as we would like to do some business with you, we have concluded to accept your proposition and put brake on it without extra charge. You can therefore forward remittance as stated in your letter, we will get the hearse ready and ship it to you. This hearse is an excellent one and certainly you are getting the greatest bargain in a vehicle of this character that was ever offered. Your favor of the 4th came to hand in due time and contents read with interest. We have been in hopes that we might hear further from you giving us your order for a nice silver grey funeral car. We believe that we could please you very much and we would spare no pains to serve you to the best of our ability. We have for more than fifty years made a specialty of fine high class funeral vehicles, that is the hearses, funeral cars, and the coaches, landaus, and broughams that follow the hearse and are a part of the funeral equipment. As you are aware the building of coaches and funeral cars is the highest class of vehicle building. This is our entire business, we give all our energies to this business and is not a side issue with us, for we do not make caskets or cheap buggies as the principle part of our business and then build hearses as a side issue. Further more we are builders of work, we do not simply assemble it, getting the various parts in different factories, but we are builders from the start, building the whole vehicle right here in our factory in one plant, building it from the start to the finish. We believe that, a vehicle built under these conditions is a superior piece of work: we believe our long experience enables us to produce the very best work for the lowest possible cost. Located as are in a town where we do not have the heavy city expenses we are enabled to produce a better piece of work at the same cost than it would be possible to do if the heavy city expenses had to be included. Another thing that we wish to call your attention to and that is, if you order a grey car we believe we can furnish you the finest grey that there is in the market. We base our judgment on our own personal experience by seeing that produced by others, and also from the opinion that our customers have given us. Even if you would get a white car we believe that we can furnish you the best wearing white and the whitest white that there is. There are some whites that will, after a short time, turn a yellowish tinge; we have overcome that difficulty and our white remains white and stand perfectly in use. We should be very glad indeed to receive your order, no pains would be spared in filling it to the best of our ability and we know we could please you very much. We just telegraphed you ordering one 9” fire bell nickle plate quick by express. We trust you will not delay us but will have sent it by express before this letter reaches you. We want these exactly the same as you sent us Oct .7th, 1907. You will remember we have ordered these with the longer plunger; of course the one that we are ordering by express we do not want to be delayed on account of the plunger but want it to go forward immediately. The other two bells arrange with the longer plunger as we have explained in former orders. We trust that the decline in the metal and labor market will enable you to give us these bells at the former price instead of the advanced prices that we have paid recently. We have yours of the 10th asking us to send you a lamp for the coach which you got of us nearly three years ago. In looking up the matter we find that this was a second hand coach. We do not keep any record of the kind of lamps used on a second hand coach, and it would be impossible for us to send you a left hand lamp that would match the right hand lamp. The only way we could possibly arrange matter would be, if you send the right hand lamp up we might able to have one to match it made. You understand that styles in lamps are continually changing as every coach wears out two or three sets of lamps it very frequently happens that a second hand coach has not on it the lamps that originally went with it. We might be able to obtain for you one lamp at a reasonable price but if it would have to be made up specially it would be more expensive, of course, than one lamp would cost when a large number of the particular style were made. From the time you have had the coach we should judge that the right hand lamp would probably not be very good and it occurs to us that perhaps the best way would be to get an entire new set of lamps. New lamps such as we use on our new coaches cost from $28.00 to $40.00 per pair. We however keep in stock some low prices coach lamps to supply those who have a coach that has been in use for sometime and want a new pair of lamps for it but do not care to go to the cost of the more expensive designs such as are used on new coaches. The low priced lamps that we refer to we can furnish you for $17.50 per pair. They are a square body lamp, have silver moulding etc. and are a good substantial lamp but they are not a fine lamp or what we use on new work but would answer nicely for a second hand coach. The cost of these is so low for the pair that we believe it might be better than to go to the expense of having a lamp specially made to match up your other lamp. We think that the saving would probably not be very great and the way we suggest getting a pair of these low prices lamps would give you an entire new set of lamps. We await hearing from you on the subject and would be glad to serve you in any way we can. Your letter of the 12th inst. at hand. In reply would say that we do not handle any undertakers supplies, we are strictly hearse and coach builders and make nothing pertaining to undertakers supplies. A few months ago one of our undertakers in this city died; his widow has now ready to sell his equipment and stock. He has a church truck, cooling board, lowering devise and other equipment that goes with a first class undertaking establishment. He also has a stock of casket trimmings etc. which will all be sold, and as we understand to be sold worth the money. We have just telephoned down to his widow who states that she wishes to sell all of this stock and has customers coming here on the 21st and 25th of this month to look it over and she also has numerous other inquiries about the stock. She will sell the stock complete or she will sell piece by piece. We think that if you would come over here at once that there might be something to pick up well worth the money. You could get some of your stock and could select a hearse and have everything all complete and we would suggest to you that you take advantage of this opportunity. Yours of the 14th received advising us, that you have sent the axle by freight. The moment it arrives we will give it our immediate attention and return it without any delay. We was very much surprised to again have your note due Feby. 28th amounting to $48.50, or figured up to the present time, $43.10, returned to us unpaid. This is the second time it has come back from the bank in your city and they write us, that you pay no attention to it. Under the conditions in which this note was given we have security for it. We can take the seat from the funeral car, also the draperies and so on. We certainly think you do not want us to take such severe methods. We therefore ask you to forward us a New York draft for $43.10, or P. 0. order for the same amount, or the money by express, as we cannot permit this small note to run past due in this way. We accommodated you by giving you the time on it in the start. Such articles are usually spot cash and certainly after doing everything possible to accommodate you, giving you the time that you wanted on them, we don’t feel we are being treated just fairly when the notes are not taken care of as they fall due and hope that you will forward this remittance by return mail and greatly oblige us. The above glass we want strictly first class and free from imperfections. We want as thin glass as possible not over 5/16 in. thick and we prefer only 1/4 in. thick. We are in great need of the above glass and are sending the order to you at Cleveland instead of Pittsburgh in hopes to get specially prompt service on it. Of the above glass please send us two lights of it by Adams Express and let the other follow afterward by freight. Please note how we want the beveling done, that on each of the lights we want the two short sides beveled and one long side, leaving one long side not beveled. Please let this have your prompt attention and do not fail to send us the two lights 30 x 46 , 1 in. bevel two ends and one side only quick by Adams Express. We are pleased to inform you that the fine Casket Wagon per contract went forward on the 14 th. Shipment left here on the B. & 0. H. R. .
We are pleased to say however, that we have sent you a fine, handsome and elegant vehicle, thoroughly first class and up-to-date in every particular and one of which you can well feel very proud. A few days ago we had a letter from Moore & Ferguson, Brazil, Ind., stating, that they are going to have some work done on the black car which they purchased of us a number of years ago. They think it was about eleven years ago. They ask us for prices on some rubber tires wheels, hammer cloth etc. . That is only to let you know how they happen to write us. Now the important part comes in the latter part of their letter and that is the most interesting for to quote their exact words they say, “later in the season we are thinking of purchasing a new silver grey or steel grey car”. Of course they may have thrown that in the letter in hopes that it would influence us in the price of their repairs, for the last word of their letter is, to make the price of the repairs as low as possible. But at any rate you can keep the matter in mind and when you are near Brazil perhaps you could do some business with Moore & Ferguson on a silver grey or steel grey car. We are also giving you a copy of a letter just received from J.H. Miner of Hillsdale, so as to keep you posted as he requests in his letter. Thank you for accepting of contract. You may tell your Mr. Atcherson that we are putting a large door in the rear of our building and will keep our new cars in the rear of casket room where they may be seen at any time. Also free from any stable and a light, clean, airy place and will try to keep them in such condition that they will be a credit to their makers as well as the owner. There has been but one funeral here this month and that was my competitors. Think people must be waiting for the new cars to arrive. We shipped the two funeral cars to Mr. Miner on Saturday, March 14th. The Fifth Wheel allowed the front axle assembly to pivot in the hori-zontal plane, to facilitate turning. Basically a wheel was placed on the rear frame section of the truck, which back then only had four wheels, this wheel that was placed on the frame was the "fifth wheel" hence the name. have had a blacksmith in your city repair the fifth wheel, and also have the front springs repaired sufficient for temporary use but want a pair of new front springs. In our telegram we asked you how many plates were in the springs. It is absolutely necessary that we know this, otherwise we could not send you springs that would be right. In your letter of the 14th just received you failed to state how many plates are in the springs. We presume they are 1 3/4 in. wide and have four plates, but there is a possibility that they might have five plates. Advise us on this point and we will send the springs immediately. The cost or the springs will be 12 1/2 cents per pound. Ordinarily from our records we are able to look up such details so that we do not have to ask our customers to give them, but the particular hearse which you have was purchased of us previous to the disastrous fire which we had in June 1903. After fifty years in this business our increasing volume of business had outgrown our office facilities and we were compelled to keep a great many of our records in cases right out in the office. The office was in the midst of the fire and these records were burned. In rebuilding we built a vault in which to keep such records, but of course that does not help in determining details of hearses that we sold before the fire, but will be an assistance always in the future. If you will let us know the width of the plates of the springs and the number of plates we can send the springs promptly. Your letter of the 16th has been received stating, that at you would like to come to some place where you and your family could all obtain employment. You state that you have five daughters, four of whom are over 15 years of age. We do not employ any girls in our factory but there are several factories here that do employ girls. This morning we were talking with Mr. Bentley, one of the head man in a concern, The Worstered Co., that employs a good many girls. He stated that he would give employment to the young women that are of proper age. He said that the work in their Worstered Mills is piece work and the girls make from 85 cents per day to $1.50 per day, as they become more skilled. We do not know at the present time any employment for the male members of your family but they could, no doubt, in this vicinity be able to obtain some employment. Of course business is not very good any place and there are more or less idle men every place. There are some idle men here but not very many. Mr. Riddle, of our firm says, that he has a house situated right back of the Post Office that he would be willing to let you have rent free for a period of five or six months. There are a good many rooms in this place and your family could probably be all accommodated there. Your letter to hand advising us of the arrival of the silver grey funeral car. We are glad to know that the shipment went through promptly and that you are well pleased with it. It is a very nice car and you got it at a great bargain in the matter of price. In fact the lowest prices that was ever made on a car as fine as this one. We sent you wrench yesterday via, U. S. Express, charges prepaid. We don’t know how in the world the wrench was left out but it must have been an oversight on the part of one of our men. We also note what you write in reference to drop curtains. In reply to that point will state, that we do not put drop curtains in any grey cars or white cars. They are not used for the casket is always exposed to view when a white or grey casket is used something that would be suitable to go in a white or grey car. Of course we could furnish a set of drop curtains, they could be made, but we do not make them for any of our grey cars unless specially ordered and paid for extra. You would probably never use them after you had them and we think you would be very foolish to go to that extra expense. Some little time since we informed you that 0. E. Gish, Sistersvi was getting very far behind on his notes and you expected to have been there before this. We have written him a great many times and he has made several promises to pay but has not kept them. We think he is getting snidey. We wish you would see him at once and take him up to the Peoples’ Nat. Bank and get him to pay at least several of these past due notes. At the present time he is $250.00 past due, part of it is on the black car, part on the white car and part on the grey wagon. Go after him good and strong and stay right by him until you get him to pay at least some of the notes. P. S. We have just received a letter from the Leach Undertaking & Furniture Co., Wellston, Ohio, ordering some attachments for a brake to put on some coach which they have; we have sent them the attachments to-day. At the bottom of their letter they say, that the Palace Coach #690 which we sent to them is making a hit, so they are evidently very much pleased with it. You thought after they got their coach you might be able to sell one to Goddard. We now have a #693 that we can ship promptly and would be glad to have you sell one to Goddard. Your letter of the 13th came to hand in due time in the absence of the writer, and it with many others has been delayed in answering. We are glad to have you write us again and are glad to give you every possible advantage in the matter of price on any piece of work that we build. We have this morning gone into the matter in detail and endeavored in figuring over the cost to see if we could reduce even a very small amount on any of the prices given you. We have figured carefully the cost of each of the funeral cars quoted you in our letter of the 4th and instead of reducing the price our figures show that we made them too low at that time and practically eliminated the item of profit. We, of course, expect to get a little profit as that is necessary in the conducting of any business. If we could possibly reduce the prices named you in our letter of March 4th even five or ten dollars we would gladly do so, but we find it is impossible as the prices are as low as we can make on these funeral cars. Now if it is price that you are after, a lower price, and are not so particular about the design of the funeral car we can furnish you a very nice car at a less price than any we have quoted you. We can furnish, and we have in stock at the present writing ready for immediate shipment, a four column funeral car which is our design #819 at a considerable less price than the designs already submitted to you. We did not submit that design as we understood you wanted an eight column, that is a design of a car similar to those sent you. We have now moving through the factory an eight column car that we can sell you at a less price. We did not mention it in any of our former letters because we did not have one ready to ship. It is patterned after the design of #847 and we fully believe that we might send you this car, if you selected #847, and you might not know the difference. In a general way it is design #847, has the same kind of a mosque top, the same kind of carving on the columns and has the same inside capacity, also the same height and length. It is constructed a little bit different and the former columns instead of being a full column that goes clear around the corner. On the other hand it does not extend around the corner but is simply on the side face about as the photograph looks but it really is different than the photograph indicates. This saves us considerable in hand carved work and there is also saving of the work on the body so that we can make a less price on the car. The car which we are describing to you is our #827 and in this particular instance if you will give us an immediate order we will make you price of $775.00 spot cash F.0.B. cars here. If you would want carved panels at the small side glass the additional charge would be $25,00. If we remember correctly you said in one of your letters that you would not care specially to have the shipment made before perhaps the 1st of June. We could not ship this #827 immediately, but we could ship it before June, perhaps shortly after the first of May. We would be pleased to receive your order for it and it is big value for the money. It is an elegant car and just as we stated above, it is so similar to #847 that perhaps you would not know the difference, but the way it is built there is a saving in the cost and we are able to quote a lower price on it. We have not as yet received remittance this month for one or more of your past due notes. Kindly forward same promptly and oblige us. We are needing the money to use in our business and needing everything that is due us in as much as you are within about 10 days of being nine months due you can readily understand that we are needing the money very much from your account. Kindly forward remittance and oblige. The first mentioned straps are good article and probably would serve you just as well as the higher priced ones. We’re pleased to hear from you again and Mr. Riddle desires to be remembered to you. Mr. Riddle is here every day at the factory giving our business his careful attention. We hope when you are in the market for anything in the way of a funeral car you will let us have the opportunity to try and please you. Your letter of the 11th, which has evidently been delayed coming through, has just been received. We note your inquiry in reference to hearses. No. 1594 black hearse has large plate glass in sides, swell glass in front and doors, carved ornaments on top, silver mounted lamps, silver inside rails and other silver mountings. Painting black in good condition and it has been newly touched up and varnished. This photograph was taken just as we got the hearse in, since then it has been touched up and revarnished so that it looks very nice indeed. This hearse is in good running order and will last in use for many years. This hearse cost new $900.00 and is really worth $500.00 to wear out in use but to you we will name the special cash price of $250.00. No. 1566 elegant black hearse has six hand carved urns, black draperies trimmed with black fringes, has large French plate glass in sides, swell glass in front and doors, silver mounted lamps, silver inside rails and other silver mountings such as whiffletree tips, hub caps, door handle etc.. This hearse is painted black is in fine condition and looks very nice indeed. This hearse is really worth $400.00 to wear out in use but to you we will name the special cash price of $275.00. No. 1576 excellent four column design black funeral car has mosque top, large French plate glass in sides, glass in front, glass in doors, heavy black broadcloth draperies trimmed with heavy black fringes and tassels, silver mounted lamps, whiffle-tree tips, door handle etc. as photograph shows. This funeral car is in excellent running order throughout, painting is all black, paint is in good condition, it has been newly touched up and revarnished and looks very nice indeed. The photographs shows brake but this has been removed, and also silver inside rails have been put in. This funeral car in really worth to wear out in use $500.00 or $600.00, but to you we will name the special cash price of $350.00. At the present writing we have the above mentioned vehicle in stock ready for immediate shipment. They are very nice vehicles and are great bargains at the prices named. The above mentioned prices are strictly cash. They are excellent vehicles, are in good running order through-out and in nice condition and we think would suit you first rate. Please send us catalogue of your transfers. Your favor to hand making inquiry for funeral cars. We are pleased to hear from you and would like very much indeed to furnish you a nice car. #851 “ “	1005.00 “ ,” “ “	“ 900.00. #846 “ “ 1200.00 “ ,” “	“	“ 975.00. #826 “ “ 1400.00 “ ,	“ “	“ 1150.00. #844 “ “ 1500.00 “ , “ “ “ “ 1250.00. Design #851 has carved work below the seat, same as that shown on #847. We have in stock ready for prompt shipment all designs except #826, which we cannot ship for sixty days. The above mentioned prices are special spot cash prices and for an order direct to us and not through any commission house or salesman to whom would have to be paid a commission, and in naming you the above mentioned prices we have eliminated all that is usually charged for selling expenses. While these prices are strictly spot cash, yet if it were not convenient to pay all cash, to reliable and responsible parties we can give easy terms of payment. That is if $200,00 or more is paid cash the balance can be paid $25.00 to $50.00 per month, or $75.00 or $100.00 every three months. Notes bearing interest and secured in the usual manner by mortgage on the vehicle to be given for the deferred payments. These vehicles are regulation adult size, they are handsome in finish and are thoroughly up-to-date vehicles. Also all of them have the late style mosque top. Number 847, 851 and 846 have the single style mosque top and what other builders usually use on all of their designs while #826 and #946 have double deck mosque top. We would certainly suggest for your city that you ought to buy #844, 826 or 846, any one of which are very handsome and elegant vehicles. You have, a population of over 6000 in your city and surely you ought to have as fine a car as #844. The above mentioned prices include rubber tire which we presume you would want. If you want steel tire we can furnish them that way and there would be a deduction of $50.00. Your letter of the 17th has been received and as requested we enclose herewith P.O. order order $100.00 for expense money, sent in the usual way. We will send you photo, of the extra fine second hand silver grey car as soon as we have it finished where we can get a photo. We would be very glad to have you sell to Ely Musgraves & Son #846 drape style black car. We are in receipt of your esteemed order for fine funeral car per contract made with our Mr. Thompson and same has our prompt and immediate attention. You have made a selection of an elegant car and one that we know will delight you very much indeed. Mr. Thompson has made you a very low price on this car and given you easy terms, so that it makes quite a bargain for you. We would be pleased to forward the funeral car to Philippi, W.Va,, about May 1st as the contract states, and we know that you will be very much delighted with the funeral car. Your letter of the 16th has been received and contents noted. We hardly agree with you in your comments on our action in getting this funeral car ready for shipment and arranging for a freight car. It is very true that you mentioned in your letter that you would want it shipped to Thompsonville, Mich. It is also very true that you said in the same letter that you would want the shipment made to Thompsonville in a few days. We do not know exactly what you term a few days, but we should suppose that a few days was not to exceed two or three days. We’re quite sure that if we had written you or anyone else that we would make a shipment in a few days and then we did not make it in two or three days they would think that we had not done as we had agreed. However that may be we have been in business a number of years and have had some experience in making shipments. A funeral car cannot be shipped in a minute in any old way like a small package of goods is shipped, but it is necessary to obtain a special kind of freight car. A funeral car cannot be put in a common, ordinary car because the door is not large enough and therefore it is necessary to obtain a wide door car or else make the shipment on an open car. If we would make a shipment to you on an open car and let the vehicle be exposed to the elements all during the time it was on the road you would think we had treated you very badly, and we would think so ourselves. We therefore, as soon as we receive an order commenced to get a freight car, because these wide doors are not so very plenty. Sometimes we can get them within a day or so and sometimes we have waited two or three weeks for a wide door freight car in which to ship a funeral car. Realizing that we might be delayed in getting a freight car as soon as you received your order we commenced to look one up. It just happened that we were able to obtain one without any delay and we therefore had the R. R. Co. hold it. As we explained to you in our former letter we went ahead to get this funeral car ready for shipment, made some changes in it to improve it and made it right for you and this car is for you, and we, having done our part, of course expect you to fulfill your part of the agreement on the car. The car is now here in the storage on it will be $1.00 per month. No. 1596 silver gray funeral car. Eight column design with carved panels. Mosque top. Large French plateglass in sides, glass in front, glass in doors. And carved columns and panel on seat boot. Finished silver gray with gold striping. As silver mounted lamps, silver wiffletree tips, hub bands, toe board handles, seat handles, seat rails, inside rails, door handle etc. Draperies white broadcloth trimmed with white fringes and tassels. This funeral car is an excellent piece of work in thorough good running order throughout, finished in the latest shade of silver gray with gold striping. This funeral car has wide track and has a break. The break can be removed and the track changed to 4’ 8” if necessary. We have this car in stock ready for immediate shipment at the present writing. To-day we had a letter from Kightlinger & Manring, Elwood, Ind., asking us to let them know the exact amount of very next note with interest figured up to the present time, Say they will send a check at once for it. Their next note is not due until May 1st but we will give them the amount and trust we will receive remittance promptly. They do not say a word in their letter about wanting us to take back the funeral cars, in fact do not say anything at all, excepting wanting to know the amount of the note. The face is $155.00 and interest, so when we get the remittance it will reduce the amount that much. Lampkins & Tucker, Anderson, Ind., have not paid anything yet. They promised you they would take up to notes on 15th of March. This is the 20th and nothing received as yet. We have written them again to-day. Yours of the 19th to hand enclosing Berton A. Spring’s letter of the 12th. As you are on the ground there it isn’t necessary to give any instructions as to making a further deal with him on a pall-bearers coach and hope that you can close with him. In reference to Aiken of Linton, Ind. we have just received a letter from him in which he says he would like to have us mail him a photo of the two cars he liked best. States that one was a design that Mr. Atcherson said would not be ready to ship before April 16th, the other one is the removable panel. Says that you will know which ones they are. We already know from your former letter. He also states that he thinks he will come here to the factory as soon as he is able to stand the trip. We dislike usually to send out photographs for they only serve as a means for some competitors sales man to hand out points to discourage a customer. Perhaps in this instance we had better send them to him as there seems no very good way to get out of it. If you think it would be best to call on him again within a few days, do so. Use your discretion about it. He seems, from his letter, and also from what he talked with you when you were there, determined to come here. Of course we would be glad to have him come, but the talk of coming to the factory delays deciding positively in reference to an order and for that reason we would rather that they would not talk about coming. We also note what you write in reference to Lauferski in yours of the 19th. They are so far behind now that the only way we see to do is to have them pay up at least several of the notes that are past due, as we wrote you in a letter a few days ago. Also while you’re in Grand Rapids we hope you will be able to get something more paid on the Stoughton notes. Perhaps if you go after Franch again you can get him to pay $25.00 to $50.00. This morning we received a letter from the First State Bank your city remitting to us $4.00 which you had paid them as a partial payment on your note due Sept. 7th, 1907. To say that we are surprised puts it very mildly. We have written you a good many times in reference to your due notes and you haven’t even shown us the courtesy of a reply. To think that you satisfy us by paying $4.00 on a note when you have $140.00 and interest past due is beyond our conception. We have written you two or three times urging you to go to the bank and pay these notes, and in one of our letters said to you that unless you did pay them that we would take legal action. You have entirely disregarded your notes, disregarded us, and disregarded our letters, and we do not propose to stand for it any longer. We know exactly what we can do and know that we can collect these notes and if you cannot finish paying for this coach we will put it into the hands of some one who can. Right at present time on our desk we have two inquiries, both of which are from responsible parties, and we can take this coach to sell to either one of these parties very easily and make money in so doing. We have no desire to cause you trouble in the matter or loss, but we do not propose to wait any longer for our money. Unless you will go to the bank in your city without any further delay and pay the balance of one note on which you have made the ridiculous small, payment of $4.00, and then take up another note on or before the 7th of April and one or more each month thereafter we shall be compelled in justice to ourselves to proceed. We mean business and just exactly what we say and we will not stand for you lack of payment any longer. Your letter of the 15th has been received. We certainly regret very much to hear that the paint on the coach is in bad condition, but we are unable to fathom any cause in its manufacture that would account for its condition. The coach was painted right here in our own factory in our regular method of painting, which is the old fashioned slow process of vehicle painting. We use the highest quality of materials that the world affords and it would be impossible for us or any one to give you better paint on any coach or vehicle than we put on the one we furnished you. From the very first coat of oil priming to the last coat of finishing varnish the highest quality of materials that can be obtained in the world was used. When we have done that we have done all that any human being can do, and if the paint and varnish has deteriorated more than the wear can use, it is from some outside cause and not from any inherent qualities of the paint itself. If you paid us ten times as much for a coach it would be impossible for us or any one to furnish any better paint than was used on that coach. We use such materials as pure linseed oil, old Dutch process special coach lead, Masury’s colors, Valentine’s varnishes etc. . These are the highest quality of materials and highest priced that there are in the world. And it seems to us when we have furnished such materials on a vehicle we have done all we could possibly do to furnish our customer the best there is in the world and given him the best possible. I will be in the market for a new car this spring. Kindly send me photos, of cars suitable for a city of 8 to 10 thousand. Send me prices on them spot cash. Olney is southeast of the center of the state in Richland Co. is the county seat. Population is given in commercial reports as 4280, the town is directly west from Vinoennes, Ind. .
A. J. Busefink uses a letter head which states that he is in the undertaking, also pictures and wall paper. He is rated in commercial reports $5000.00 with the first grade of credit for that amount of money. In his letter he underlines the words spot cash. Some times that in a letter does not mean very much when they are making inquiries as they want to get a price that is way down and then get time, as you well know. He also states in his letter that he wants cars suitable for a city from eight to ten thousand. It may be that Olney, Ills., has increased in population and he wants it for that town. On the other hand, he may have some other point in view. We know nothing of him but his letter. It occurs to us that you might go down that way and corral a sale. We have written him that you would call to see him soon. Don’t suppose there is any great rush about it. We have several #844 black cars that do not seem to be moving off very rapidly recently. Would be glad if you have an opportunity that you make a special effort on that particular design, which we have in stock ready for immediate shipment. Perhaps you could stop at Linton, Ind. on your way down or back and close up with Aiken there. Your letter of the 19th from Grand Rapids has been received stating, that you closed the deal with Berton A. Spring for three jobs same as we have them all ready and the #693 pall-bearers coach, that is the one with dash etc., taking in top casket wagon at $200.00 leaving a balance due of $3500.00. You also state that you agreed to send him two oil cups for his casket wagon without charge. We are perfectly willing to do this but as we never furnished him a casket wagon we are somewhat at a loss to know just how to fill the order. Of course if he would send us one of the oil cups we could make some that would be right. You say down at the bottom of your letter, that the wagon was built by the Rock Falls and sold to Mr, Mason. We do not know whether you mean the one he wants the oil cups for or whether you mean that the one we get in trade is that one. In fact we feel quite sure that is what you mean, because we see farther up in your letter you say, that the top casket wagon we get in trade is the Mr. Mason one, so that settles that point all right enough. Then again we think you may mean he wants two new oil cups for the funeral car we furnished him but by a slip of the pen you have written casket wagon instead of funeral car. Let us know so we can try and get them ready to send along with the shipment. Also if you know, please let us know where these oil cups go, that is whether front or rear, or whether right or left hand side, for the threads the oil cups are rights and lefts. Also let us know whether we should write Berton A. Spring that you have forwarded to us his order for #693 in addition to the other two vehicles, or whether we had just better say nothing about it and ship them right along the first of April as the original order state. We have no objection to writing the letter to Mr. Spring, the only reason we hesitate about it is because some times too many letters mix things up and are worse than if letters are not written, for experience has shown us that the less communication the better we can have from a customer from the time we receive an order until we write them that the shipment has been made. For if we get to corresponding with them there will always one thing and another come into their mind that will cause delay. We have just received a letter from Lamkins & Tucker, the gentlemen of color at Anderson, Ind., stating, that they have not been able to take up the two notes that are due and promising to do it now on the forepart of April. This is not very satisfactory and we think we will write them a pretty strong letter and tell them they must pay now or we will have to get after them etc..
Yours of the 20th from Grand Rapids has been received. Note what you write in reference to Lauferski. Certainly hope they will go to the bank and pay something. Also in receipt of yours of the 22nd from Hillsdale. We certainly hope that we will hear favorably from Three Rivers with something paid. We also note what you write in reference to Wm. S. Hetrick, Oak Harbor, 0. and that he promised to come to the factory to-day. It is 1:30 in the afternoon as we are dictating this letter and he has not showed up as yet. We enclose herewith our #834 which is the style funeral car which we sold to Isaac Ball a good many years ago. This car was sold to him several years before the fire which we had June 28th, 1903. In that fire our indexes were burned up and therefore we are unable to know just when the shipment was made. If we are not mistaken however it was more than ten years ago. We are pleased to be able to inform you, that we have to-day shipped you the excellent funeral car #1567 as agreed. Shipment has gone forward via the B. & 0. R. R. to Parkersburg. Your letter of the 23rd has been received. We are pleased to hear from you but regret to say that we are unable to furnish you a First Call Wagon. We have neither new ones or second hand ones. They are something that we do not make and a little bit out of our line, being more after the character of work made by buggy builders. At the present time we do not know where a second hand one can be bought; possibly some of our men may know of a second hand one. We will make inquiry, and if they do, will be glad to let you know. Are you not ready for something in the way of a car? Would you not like a silver grey car? We think one would be an advantage to your business. We have some second hand grey cars that might suit you. We shall be pleased to hear from you whenever you are in the market for anything in our line. We have yours of the 23rd in reference to Brougham. Since our Mr. Riddle called on you last fall matters in the carriage business have changed very materially. You say in your letter that Broughams do not sell very good in Pittsburgh. That same condition applies everywhere. Every one knows that there is a great slump in business in a general way, of course, that has effected the carriage business the same as every business. Some other business may have some hopes that after the depression is over, which may continue either a long time or a short time, that their businesses will return again with the old vigor. 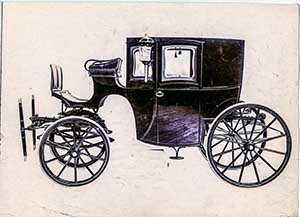 This can not be hoped for in the carriage business, because the automobile has knocked out the sale of a carriage. So that even when general business does revive the carriage business can not be expected to return to the prosperity it had. Under the circumstances we would hardly feel justified in buying the Brougham; certainly not at the price Mr. Riddle offered last fall. We fear that if we had it we would have to keep it for several years, although we might be fortunate enough to dispose of it quicker than that. Under all these circumstances we would not care to put very much money in the vehicle. We might be willing to risk $100.00 in it, and if a New York draft for $100.00 would buy the carriage properly loaded and shipped to us we might consider it. But under existing circumstance we would not care to put any more in it. Your letter of the 23rd has been received. As we wrote you before there is employment here for girls In the Worsted Co.
Mr. Bentley, that we mentioned in our former letter, is one of the head men in the Worsted Co., and it is the same concern that you mention, Cleveland Worsted Mills Co., who have two large mills here, as well as a mill in Cleveland. Mr. Bentley is a director in the company, and he is the managing director here. We are not just positive the youngest age that they will employ girls, but it is governed by the state law. As we do not employ any girls we are not real positive as to the legal age they must be before they are permitted to work. We think it is 14 but we are not sure, it may be 16. If you would write to C. G. Bentley, Ravenna, Ohio, he could give you full particulars on that point. We think your daughters could obtain employment here all right in the Worsted Mills and that it would be very satisfactory employment. It is nice work and a nice class of girls work in the Worsted Mills. As we stated in our former letter, the work for the male members of your family might be harder to get, although there is considerable work in prospect here, and while there are some idle men there are not so very many and not as many as in most towns. We have just recently put in a sewer system and there will be a great deal of connecting to be done this summer, and that will give employment to a good deal of labor. The house that we mentioned before that Mr. Riddle said he would give you the rent free for a few months is not of course an aristocratic home that would rent for $25.00 or more a month but it is a good comfortable place situated right in the center of the town and is right back of the Post Office and rents for $6.00 per month. Tomorrow you will have another note come due, which will make six past due. In other words you are six months behind. We have already written you and called your attention to these past due notes that you still keep getting farther and farther behind. We cannot stand for it after having given you nearly four years time in the start. We are needing the money to use in our business and we must ask you to forward remittance for at least four of these past due notes without fail by return mail. We do not wish to be compelled to take more severe methods but we cannot continue to let the notes run past due in this manner. We certainly hope that you will not force us to use our mortgage in this matter. We have no desire to cause you any trouble or annoyance in the matter but we do need the money to use In our business. We have our men to pay every Saturday night and our bills to meet every week, and therefore must have what is due us. Your prompt attention to this matter is expected or we shall be compelled to take some other means to collect. Yours of the 22nd from Hillsdale has been received and contents noted. We have had no call as yet from Hetrick of Oak Harbor. We note that French of Grand Rapids promises to send $15.00 next week sure. We had a letter from the Palace Livery Co. wanting until Apr 1st or 2nd to take up their notes due Mch. 12th. We have granted the extension. This morning we received a letter from Mr. Miner of Hillsdale enclosing the notes and conditional sale contract duly signed, as of course you know for you are one of the witnesses. We are surprised that the shipment has not got there yet, as it left here on the 14th. The shipment certainly ought to reach their pretty quick. Also note what you write in reference to other parties in Hillsdale. Grand Rapids, Mich. , 3/22/1908. What price could you make on the secondhand wagon of good make, something worth $500.00 or $600.00 new. Rubber tires and in good condition. Your rep. told me some time ago that you could sell me fine wagon second hand wagon from $200.00 to $300.00. I am looking for a bargain. Am in no hurry but at any time you have anything that’s right of the kind in the next few months to come let me know, send me particulars and photo. I prefer glass side wagon. What would a wagon like the one you sold to the Chambers Co. of this city cost now? Let me hear from you soon. We have not answered the letter yet, we just received it to-day. We think it would be possible to sell the wagon which we taking trade from Berton A. Spring. How would it be to write him that we have made a deal for secondhand wagon that we can sell him for $250.00; that will let him know and so on; what you think of that? What sort of fellow is Corkery? We think that we had a letter from him once before and wrote you about him and that he was not very strong. We therefore think that you know him and may be able to give us advice on the subject. We could, of course, furnish you the necessary materials for changing the four column black car, repainting it white or gray. You would find it would put you to a good deal of extra expense and you ought to consider before going to expense on and whether or not it would not be best to sell the car as a black one as it is, or else buy new gray or white car turning in the old car as part payment. So far as painting is concerned, it would be necessary first to burn off and remove clear down to the wood all the old paint. Then it would have to be repainted from the beginning building up with priming lead, rough stuff etc. in the usual manner of vehicle painting to as far as the color coats. Your local carriage painter would thoroughly understand the work so far as that part of it is concerned. When it is ready for the color coats we could furnish you the necessary material in either white or silver gray. This material for the color coats would cost about $10.00 including the varnish in which it would be mixed, or we could send you just the color itself and you could have your painter obtain the varnish. We would have no objection to giving you suggestions as to how these color coats are to be applied. After the color coats are applied and polished it would then be ready for the striping. You could have it striped by your local carriage painter in any way you might wish. You could have him stripe that with gold, which is the nicest kind of striping, or you could have some color striping. A set of draperies of either white or gray made of imported broadcloth and trimmed with heavy fringes and tassels to match would be worth $60.00 net cash. This price is for a set of draperies suitable for an ordinary size column car. White or gray cloth suitable for headlining inside would be worth $3.00 per yard, this is for double width. It would probably take about 2 1/2 yds., unless you had the top rayed, which would take a good deal more. There probably would be no one in your city who would know how to do the rayed work and it cannot be made and sent to you, as it is necessary for the vehicle to be right beside the trimmers bench in order to properly do rayed work. We have no secondhand grey drapery. We might however, if you would give us the exact size of your glass in your car, that is both the side glass, front glass and door glass, be able to select a set of white draperies that would answer you that we can furnish for $25.00 or $30.00. We have new hearse lamps at all prices from $30.00 per pair to $100.00 per pair, that is we have them at $30.00, $40.00, $45.00, $55.00, $85.00 etc. . Lower-priced ones we could submit cuts to give you an idea as to what we have in stock in way of lamps. We think you would find you would go to a lot of expense and then would not have a very satisfactory vehicle in the end. Of course that is not for us to say but simply mention it so that you can think it over before going to expense on the old car that would only be an old car in the end. At the request of Frierson & Co., 205 San Filip St. your city, we have shipped in your care for them and ambulance and enclose here within bill of lading for the shipment. We also enclose for the balance due us site draft on them for $50.00 and $475.00 in notes with chattel mortgage for their signature. Also have two witnesses sign the chattel mortgage and have Frierson & Co. acknowledge its execution before a notary public or other authorized officer. On payment of draft and when all the notes and mortgages are duly signed and executed, please deliver to them the bill of lading so they can get the shipment. Then have the mortgage at once placed on file with your County Clerk, taking his receipt for same on the enclosed postal, which receipt return to us with the notes and proceeds of draft less cost of acknowledging and filing mortgage and for your trouble. Kindly let this have your attention and oblige both of them and us. We are pleased to be able to inform you, that we have to-day shipped the excellent funeral car per contract. Shipment going forward via the Penn R. R. in our private freight car #7. We write you just a few lines to let you know the shipment has started, full details and particulars will follow by later mail. We’re pleased to say however, that we have sent you a fine, handsome and elegant funeral car, thoroughly first class and style and up to date in every particular, and one the use of which cannot fail to give you the highest satisfaction. We have already written you the fine funeral car went forward on the 23rd via. the B. & 0. R. R. in B. & 0, car #92769. The shipment is made in a large door box car from which it is very easy to unload. You should have the freight car placed beside the station platform so that you can bring the funeral car out of the freight car to the station platform and then down to the ground. The funeral car is taken off its wheels and set down flat. Have plenty of help and use great care in unloading not to let it strike any place as you bring it out the freight car doors, You should get some 2x4 pieces to put underneath the axles to slide it on, then with four light crow bars you can slide it forward, turn and out of the freight car doors to the station platform. Watch carefully both the sides and the top that it does not strike any place as you bring it out the doors. Have plenty of help and if you are there yourself to watch and see that they go at it slowly and carefully you will have no difficulty and can unload it in a very few minutes without a mar or scratch the same as we loaded it. After you have it out on the platform you can set it up on its wheels and run down to the ground. In setting up be sure to get each wheel to its proper place. They are marked with tags to show where they go and also by punch marks on the ends of the boxes to correspond to similar marks on the ends of the spindles thus . .. . . . . . . Inside the funeral car you will find the pole straps, wrench etc. . . The push button which operates the electric bell is on the bottom near the doors. After unloading the new car please put the one which we take in trade into the same freight car. Fasten carefully and securely in the same manner as the new one and ship to us. Be sure that it is fastened carefully so that it will not get loose while on the way. We have drawn on you for the cash payment and sent the papers for your signature made out in accordance with contract, as contract provides, to the Marshall County Bank your city, please call there and attend to same. Now as the hot summer weather will soon be here, care should used and not permit a new highly finished vehicle to stand exposed continuously to the hot rays of the summer sun, for being black and having so much glass about it naturally attracts the heat and hot sun might blister the varnish. When waiting at a funeral it is a good plan to get in the shade, if convenient, if not keep on the move. We mention this simply as a warning. At the request of D.C. Lutes we have shipped in your care for him a funeral car and enclose herewith bill of lading for the shipment. We also enclose for the balance due us sight draft on him S100.00 and $800.00 in notes with deed of trust for his signature. Also have two witnesses sign the deed of trust and have Mr. Lutes acknowledge it before a notary public or other authorized officer. On payment of draft and when all the notes and deed of trust are duly signed and executed, please deliver to him the bill of lading so he can, get the shipment. Then have the deed of trust at once placed with your county clerk for record, taking his receipt for same on the enclosed postal, which postal return to us with the notes and proceeds of draft less cost of acknowledging and recording deed of trust and for your trouble. Kindly let this have your attention and oblige both him and us. Our agent, Mr. Atcherson, who called on you recently states that you requested him to have us send you one front flapper for the right hand door of a landau of our make, which you have in use. Said landau being the one that we sold to Mr. Peterson many years ago. It will be necessary that you send the broken flapper in order that we may select another one that is exactly the right style, that we may cut it off the right length and otherwise arrange it to fit on the door perfectly. There been at least one hundred different styles of landau flappers used, and while we have not used every style of landau flapper that has ever he been made, we have used a great many different styles, and in order to select one that is the right style it will be necessary to have the old one. In sending it to us, be sure to send the small parts, or that is what are usually termed the feet, the part that the screws go through to fasten it on the door; that is the place where they differ most. Some of them have horizontal feet and some have perpendicular feet; some have one foot horizontal and one perpendicular and so on and then they are different lengths on different styles of flappers. We make this long explanation so you will know why it is necessary for us to have the old one. We keep a careful record of each vehicle that we turn out and this record shows the style of landau flapper used. After more than fifty years in this particular line of work building carriages our business had outgrown our office facilities and we were compelled to keep the records right out in our office in cases. The fire which we had five years ago destroyed these records, so that we are unable to look up the details and mechanical measurements on carriages that were turned out before the fire. In rebuilding we built a vault in which to keep such records, so that even if we do have another fire the records will be preserved. We mention this so you will understand why it is necessary for us to have the broken flapper in order to select a new one that is just exactly right. We have to-day sent one of your long past due notes, $50.00 interest, to The Cleveland Trust Co, your city for collection. Writing the bank to hold it for a few days awaiting payment. We give you this one more opportunity to pay. The note is absolutely good as it is amply secured by mortgage. We must urge you to pay it without further delay or we shall put it in the hands of Attorney Resek to foreclose the mortgage, take judgment against you, make levy on all your stock etc. . Your favor to hand and contents noted. We are pleased to hear from you and would like very much indeed to furnish you a fine funeral car. We have some second hand eight column cars that we think will suit you all right but just at the present writing they are in the painting department being rubbed down, touched up and revarnished etc..
One of them will be ready in a few days and we will be able to get photograph of it. We will be pleased to forward to you with full particulars. Another one that we also think would suit you is a little bit farther back but It will be ready; to photograph in the course of a couple of weeks. We have some second hand cars in stock at the present time all finished but they are not eight column cars, they are four column cars. The eight column care which you say you want will be ready very soon. Trusting that you can wait a short time we will be pleased to forward photographs etc. .
We wrote you on the 23rd calling your attention to your past due notes which you promised to pay March 15th. We have received no reply nor no remittance. We have before us your letter of Feby. 11th in which you promised positively that by the 15th of March you would pay up all past due notes including the protested check of $200.00. We must urge you to forward this remittance without further delay or we shall be compelled to put the matter in the hands of our attorney. We have been very reasonable with you and given you a great deal of extra time. You are very far behind, in fact the farthest behind of any one on our books and we must urge you to pay without further delay. Your prompt attention is expected. We have before us your letter of Jan. 21st in which you promised that you would pay your past due note in the spring. Spring is now here and we must have amount paid. We are not going to be put off by you any longer. You have not paid anything for a long time and we must have a remittance by return mall. Your prompt attention to this matter will prevent legal steps being taken as we will not wait any longer unless you pay. We have your favor of Mch 21st enclosing contract of Barclay, Higdon & Co. of Globe, Arz., for #811 Landau and same has our best attention. As you request we enclose two copies of price list and descriptions same as we sent you last September. You will see by this price list and also if you will look at photo #871 that this design is not a landau, but on the other hand #811 is a brougham. We are therefore at a loss to know whether the #811 shows the correct style, or whether on the other hand an error was made in the number and it is a landau that they want. We would think they would prefer a landau. At the present time we have in stock landaus #806, #542. If we remember correctly we did not send you photo. #542 landau by this same mail. You understand of course that a landau is a carriage that the top opens up and lets down, and for that reason for Globe, Arz., a point where it is very warm we would think they would want a carriage that could be opened up. No. 811 is a brougham and the top cannot be opened up as the top is solid. Your salesman made some notations on the contract that would make it impossible to fill the order for #811. The first item is for toe board like #690. No. 811 is not made with that kind of a toe board, but on the other hand has dash. It would be impossible to furnish #811 with toe board, except to build it from the beginning, for that part must be arranged at the time the vehicle is started. As you are aware it takes a long time to build a vehicle of this character and they are about six months going through the factory. It is probable that, your customer and also your salesman did not realize this. The question of changing the lamps could be arranged. question, because the body is built so that the front gear would not turn under on the extreme wide track. This particular carriage is made for the standard track, 4’ 8”, the carriage is made very compact with that idea. We are aware that in some sections out in the country wide track is used. We can make all funeral cars wide track. We can also make #542 landau wide track and also #762 Bell top Berlin Coach can be set on the wide track. But Broughams, that is numbers 802, 820, 852, 8ll and 916 will not permit the wide track because of the compact manner in which the body is constructed. A coach of this character however, is used for city purposes only and in a city it makes very little different what the track is. For long drives in the country of course the track in use in the vicinity would be best, but for city use the wide track is not desirable. A wide track on a brougham, that is on the smaller carriages, would look very awkward, would be all out of proportion to the vehicle, such a wide track is not as good from any point of view. The axle being much longer is that much weaker and liable to be sprung, it takes more room in turning around; it takes more room in the stable and looks very spready and out of proportion. We would be glad to furnish #542 landau or #752 Bell top Berlin Coach with wide track if necessary, but the broughams cannot have the extreme wide track. They are really in error in desiring a toe board instead of a dash. The dash style is much more satisfactory than the toe board. A toe board is used for a street hack where trunks are carried on the footboard, but for a nice carriage in a livery stable for use at funerals, parties, weddings etc. a toe board is not desirable any more, is not used on any of the carriages here in the east and is really a style that is new past and gone. It makes them look too much like a hack. The object of every one in having a carriage of this kind is that it may have a private appearance. We are certainly very sorry to have these complications come up in this first order that you sent in but we cant very well fill the order just as the contract reads, except to build something from the very beginning which would take so long. We feel they would not want to wait that long. We are always willing to make any little change we possibly can to fulfill the notions of the customer, but there are some changes that from the point of construction is impossible to make, such as the toe board in place of the dash on the design built with a dash. A change of that kind could not be made except to commence at the beginning, as we could very easily show you if you were here at our factory. We are taking the matter up with them direct to-day and it also might be well for you to write them something after the manner we have suggested above. We are in receipt of your esteemed contract for fine #811 Landau per contract made with our western representative, Mr. Giraud, and same has our prompt and immediate attention. We are pleased to commence doing some business with you and no pains will be spared on our part to please you. We are compelled however, to write you in reference to some of the details on the contract. 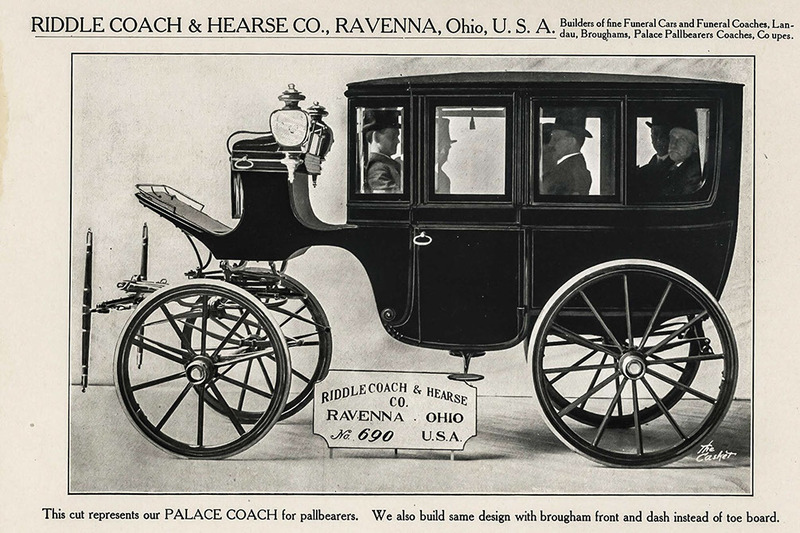 In the first place the order calls for #811 Landau; we presume for your section where it la very warm you want a carriage that the top opens up and therefore we take it that you want a landau. No. 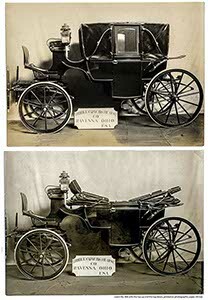 811 however is not a landau but is a brougham with solid top and is a smaller size carriage, although it seats four inside comfortably, but the top cannot be opened up. There is another point and that is, the order states that you prefer toe board instead of dash. The toe board is a thing of the past and now all carriages in the east have the dash, as it gets away from the appearance of a hack. There is no advantage in a toe board any way and therefore all the finest carriages are now built with dash as our photographs and cuts show. We feel sure that you would prefer the dash carriage as it is much more up-to-date than the toe board style. It would be necessary to build a carriage from the very beginning in order to furnish it with toe board, for this is one of the very first points that must be arranged. It takes six months to build a coach of this kind and therefore we feel sure when you consider the matter you will let us send you the carriage with the dash. Another point is the extreme wide track which you mention on your order. A carriage of this kind is used only in a city, is not for long drives in the country over the country roads except occasionally and therefore they are all made with standard track. There was a time when the wide track was used in many of our towns and cities but that is a thing of the past and now all carriages that we send to Pittsburgh, Cincinnati, Nashville, New Orleans, San Antonio, all the points that did at one time want the wide track, they all now use the standard track. As all owners know it is much better for the carriage to have the standard track instead of the wide track, the vehicle has a much better appearance, for the wide track makes it look too spready and then it takes less room in the stable and also in turning around, and in fact the standard track, is conceded satisfactory in every respect and there is really no advantage in having the wide track. No. 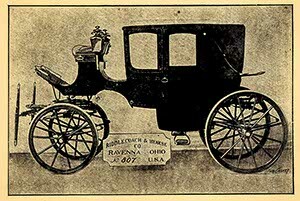 811 brougham which is a very compact carriage could not be furnished on the extreme wide track, because the front gear has not room to turn under on the extreme track. If an the other hand it is a landau which you want, that is a carriage that the top will let down, and you will let us send you #545 which is the latest and handsomest vehicle of the character we could furnish it on the wide track, if you insist upon wide track, although we would from our experience not recommend the wild track. If on the other hand you would prefer a solid top carriage and still want the wide track we would be pleased to send you our #762 Bell top Berlin Coach, which can be furnished on the wide track, as there is room on the carriage for a wide track, but there is not room for the gear to turn under on #811 brougham, also the same price on #542 landau. By this same mail we are sending you photograph of #811 brougham, #542 landau and cut of #762 Berlin. Kindly let us hear promptly in reference to the toe board, the track, whether you prefer the #542 landau, the #792 Bell top Berlin, or #811 brougham and we will be pleased to give the matter our most careful attention. We take pleasure in promising you an elegant carriage, thoroughly first class and up-to-data in every particular and one of which you can well feel very proud. We have your letter of the 27th asking us confidentially in reference to 0. E. Shob & Co. .
Our dealings have been with O.E. Shobe, we do not know who is his partner or who comprises the company of them firm which you mention. A partner might add to his financial strength. We have furnished Mr. Shoba somr coaches on which we gave his time payments. He still owes considerable the present writing is a couple of months behind his payment. We think he is a man who tries to pay him when he has the money, but we rely on our security in such a case. We haven’t a doubt but that he would make every possible effort to meet the payments which you mention. At any rate that is what we believe to be true in reference to him. However if business with him would be dull he would probably get behind on them the same as he is with us. We have been endeavoring for some time to get him to catch up on his payments but he keeps about so far behind all the time. The above is strictly confidential. Just this moment received your telegram received your telegram asking us to send our salesman, Mr. Thompson at once. Mr. Thompson is now way down in W. Va, where he has some important matters on hand and it would be impossible for him to get to your city. As we wrote you a few moments ago if there’s anything wrong with the funeral car we will make it right. We know so far as varnish spotting is concerned it will not amount to very much but even if it does we will see that it is made right. In shipping this funeral car we shipped it in a boxcar, in fact in one of our own private freight cars so as to protect it is much as possible while on the way. As a rule shipment of this kind of large and bulky freights are necessarily made on an open car, that is a car that has no cover at all and if you had bought the funeral car at almost any other builder you would have found this to be the case. Being though such a very terrible rainstorm as it did, in fact one of the worst lines and rainstorms that has occurred over the state of Ohio for many, many years it isn’t surprising that it may have a little water on it. It is something that we or anyone would be powerless to prevent and that surely must be much better than if it had been sent on an open car, as the majority of manufactures of this class of work make their shipments. As stated above and in our former letter we think that you will find the varnish will not spot to amount to anything but the spots will come out all right, and in any event we will see that it is all right for you. Years of the 26th from Huntington has been received. We note what you write in reference to A. A. Fuller that he has decided to keep his old wagon and not traded in on #882 and we will arrange accordingly. We’re very glad that he is made this decision. Note what you write in reference to T. M. Lynn, would be glad to have you do some business with him. We are also in receipt of the order enclosed in the letter from Al. Windle for #811 shield glass coach, #166 harness and same has our attention. Since receiving this order we have had to change some of the orders that we already had in order to fill it. We now think we have matters adjusted so we can fill it all right and can send him a maroon trimmed one. However do not take any more orders for #811 until we get some on hand, so that all that we have are covered by orders and will not have any more that are not already covered by an order for 60 days or longer than that. We have plenty #852 so make a special effort on #852. We’re sending you photograph #838 by this same mail. We have yours of the 30th. In reference to hardwood lumber will state, that we have a large supply and do not need any the present time. We will not need to replenish our stock until next year. You will remember that when the $750.00 note given by Central Development & Security Co. and endorsed by Pennsylvania Opispo Plantation Co. matured, January 3, 1908, the initial request that they be permitted to pay the accumulated interest and one half of the principle of the note. This was done but as yet the remainder of the note has not been paid. What arrangement did you make in reference to the time to be given them on this note? I intended to ask you when I saw you in New York but it slipped my mind when I had the opportunity. I therefore right at the present time at your fathers request. On March 14, 1908, we shipped a car load of hearse via. your R. R. billed to J. H. Miner, Hillsdale, Mich..
As we understand the matter the shipment was to go via the Erie to Cleveland and then via the Lake Shore to Hillsdale, Mich. 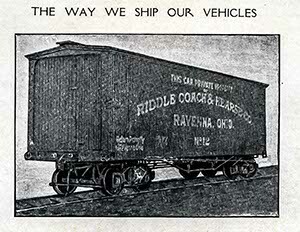 The shipment went forward in Riddle Coach and Hearse Co’s car #5. After the shipment had been gone several days we received word from the consignee, J. H. Miner, Hillsdale, Mich., that the shipment had not arrived and that his freight agent of the Lake Shore R. R. was unable to hereof them being on that line. We telephoned you in reference to the matter and you send a tracer. A few days after that we received another communication from Mr. Miner complaining bitterly that the shipment had not been received, that it was making a loss to him, as he was not having the vehicles to use and that he had use for them. We asked you to send another tracer, and as we recollect it, you told us that you had not received any word from the first tracer. On last Saturday afternoon, March 28th, you will recollect we telephoned you that we had received another communication from Mr. Miner that the shipment had not arrived and could not be located on the Lakeshore R.R. and asking us to look the matter up. You informed us at that time that you had received word from one of your tracers stating, that the shipment had been delivered to the Lake Shore R. R. at Cleveland on March 15th and that your freight office in Cleveland were taking up the matter with the Lake Shore to get it traced. Yesterday afternoon, Monday the 30th, we telephoned you ordering a freight car to be ready for shipment to us few days. You told us that freight car #5 was back empty and that it was very strange that our customer in Hillsdale had complained about the arrival of the shipment when the shipment must have reached their several days for the freight car to get back empty. We told you that the freight car should not have come back empty but that Mr. Miner was to ship to hearses to us in the same car that the new ones went in. You investigated and found that although the car was billed to you empty it was loaded. Upon examination was found containing the same vehicles which left here in its March 14th billed to Hillsdale, Mich. In other words, after more than two weeks time the shipment had not reached Hillsdale but was back here in Ravenna again. Upon examination we found that the car had been entered, we presage to make some repair to the freight car, one of the vehicles unfastened, probably for that purpose and then not fastened. And instead of being sent on to Hillsdale was by grievous error on the part of someone build back empty to Ravenna. The damage to one of the vehicles because it was not fastened thrown about in the car was considerable. We do not know what that consignees will say about the shipment when it arrives after so much delay that may refuse to take it. In any event we will hold the R. R. Co. responsible for all damage. We give you the detail in reference to this so you can take the matter up with your officials right away to see wherein the fault lies and what was the cause of this grievous error.